Cold. The forecasts all were for cold and windy. "Brisk" was the most benign forecast I could find. The briefer had told me to expect 40 knot winds from 360--due north--at 3000 feet. He said it promised to be a good day for VFR flying--"if that wind doesn't bother you." Well, I'd had to postpone this trip three times already, twice for bad weather and once because the airplane had no beacon or landing lights. So despite the predicted wind, I thought we'd start out and see how it would feel in the air. The general direction would be westward, so I hoped that a north wind wouldn't cause too much trouble, as long it there wasn't too much turbulence for comfort. . The actual course I'd planned had a couple of minor jogs, one around the north end of the Farmville MOA, and another to keep a few miles away from the Lynchburg airport. The jogs also put the course directly over the state prison at Dilwyn and located a turn over the town of Gladys--my stepmother's name. So I filed a flight plan, figured the wind into my headings and my elder son Chris and I drove to the airport. It was -5 C when we arrived there at 9. The surface wind there was 340 at 10, gusting 24--that is, right down the runway, but somewhat blustery. We had warm jackets, but figuring that we'd have cabin heat, we hadn't worn our long johns. That turned out to be a Big Mistake. We walked out to preflight N10902, a Cessna 172 that I'd never flown before. I'd avoided renting it because I knew it has the older electric flap control with a toggle switch, rather than the nice later version that has detents for the lever, so that you can move the lever to the flap angle you want and let go, and the mechanism keeps moving the flaps until they reach that angle. The older version requires you to work a toggle switch and peer at a flap angle indicator over in front of the passenger's seat and that is hard to read and in any case doesn't read accurately. What's worse, the switch is constructed so that if you depress the toggle down hard the flaps will keep going down after you let go of the switch unless you stop the movement by jiggling the switch. But when you want to retract the flaps, you have to hold that toggle up constantly until the flaps are completely retracted. When you're busy with other things--as in a go-around, for example--that can get downright bothersome. Also, N10902's airspeed indicator is calibrated in mph, rather than knots, so I'd have to remember a different set of V numbers. And it has a 150 hp engine, instead of the 160 that the FBO's other 172's have. Oh, well, this airplane was available--and everything seemed to be working correctly, so I gave the engine 4 shots of primer and it fired up. We took off and headed almost straight out, heading 324, figuring to crab rather fiercely into the wind. The actual no-wind course to our first checkpoint was 302 degrees magnetic. 1. The wind aloft was nowhere near as strong as predicted, and at 2500 feet we settled into a heading of 315 that seemed about right to keep us on the 302 course for the first leg..
2. It was very very cold in that airplane. There was some cabin heat, but only if we held the knob out all the way. As soon as we let go of the know it would slide itself back in almost to the panel. Worse, however, was that both of the wing-root fresh air vents leaked badly. We fiddled with them without success. Anything we did to them just made the twin blasts of cold air worse. We finally settled on positions such that the outside air thermometer was upside down, so I never did get around to deciphering what it p!es. (Can you read that upside down? No? Well, it doesn't matter any more than the exact temperature did.) After we got home, a friend advised me to carry a roll of duct tape for problems like that when I rent airplanes. Beyond the Farmville MOA I turned southwest and climbed to 4500 feet hoping to gain an advantage from the north wind. But even at that altitude it couldn't have been blowing much more than 30 knots, not the 45 or higher that had been predicted. The land rises west of Farmville, and by the time we neared the lake 4500 feet MSL was only 3600 AGL, and because the wind wasn't helping us much anyway, I began descending to 2500 feet. I had a GPS, but used it mainly to confirm my pilotage--and twice to confirm that we weren't quite where I thought we were. I would eventually have been able to get oriented each time without the GPS, but that would have cost me some adrenaline, so I was very glad for it. Every time I use a GPS I have to admire everyone who navigated before they became available. One of the times that Mr. Geeps--that's what I sometimes call the GPS--said we weren't where I thought we were I did a rather dumb thing. I took my own word for it, rather than Mister Geeps's. 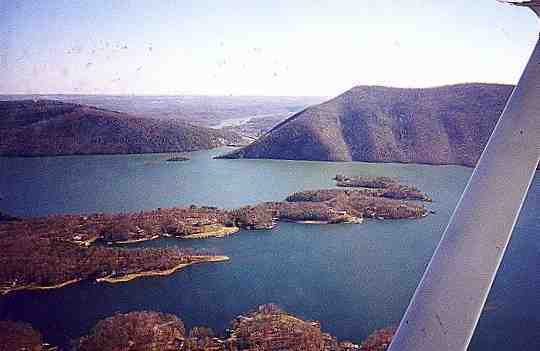 I saw that we were approaching a lake with a large dam across it and assumed that it was Smith Mountain Lake. 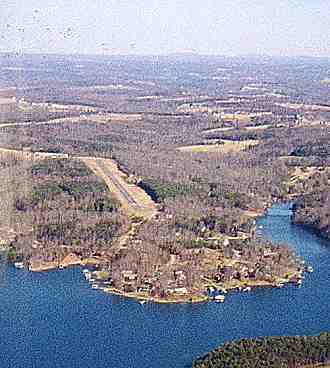 Mister Geeps said that Smith Mountain Lake was to the north of that lake, but I turned slightly south and flew toward the dam, while trying to figure out why the lake was so much narrower than it looked on the map. I began to feel disoriented--couldn't make sense of the map and what I saw outside. Then Chris spotted the real Smith Mountain Lake, just appearing behind a hill to the north. Naturally, it looked just like the map lake, and naturally Mister Geeps said that it was right where he'd been telling me it was, all along. The hill, of course, was Smith Mountain. So I turned right and we flew around the mountain, turned west out over the lake and past the dam. The open basin above the dam is quite large (and, we were told later, deep--150 feet or more). Two rivers converge above the dam to create the lake, and there are lots of other fingers of water, making it quite a lovely view from the air. In this view looking south you can see through the pass and beyond the dam the "lake" I mistakenly thought was this lake. This photo shows maybe 5% of the whole lake. I was wishing that the 172 had floats. We turned north again and flew up the main part of the lake to the airport, W91. Its runway, 5-23 is close to the water and it rises 40 feet from the 5 end to the 23 end. The windsock showed the wind coming from due north at about 8 knots, so I landed uphill on 5, crabbing about 15 degrees on final. But below the trees the wind dropped off and I had to turn, rather than slip, to stay on the centerline. This is the approach to runway 5. We were so cold from sitting for an hour and a half in that drafty airplane that we could hardly walk. The owner, a retired airline pilot, let us into the office and I easily beat Chris to the john. The owner told us that the nearest eatery, The White House, was about a mile up the road, so we started hiking. That mile turned out to be more like two, and by the time we found The White House, we had almost warmed up. The White House was closed for remodeling (why hadn't the airport owner mentioned that?!) Fortunately, there was a big Amoco station just across the street with a cozy snack bar, where we had moderately hot food and pretty hot chocolate. We stopped in to a realtor's office next door, to see what property costs thereabouts (not too terribly much), and he offered to drive us back to the airport. The wind was still from the north at probably about 8 or 9 knots, meaning that for runway 5 the headwind component would be about 5 knots. Should I take off on 5--upwind and uphill? Or should I use 23--with a 5 knot tailwind but downhill? The slope is 40 feet in 3900 feet (which includes a displaced threshold for trees on the approach end of on 5), slightly more than a 1 percent grade. That's not steep; but the land beyond the 23 end of the runway appeared to continue sloping upward at about the same angle until the top of the hill, maybe 200 feet higher than the runway. I'd been thinking this one over for a couple of weeks and had decided that as long as the headwind on runway 5 was more than 5 knots, taking off uphill would probably be better. So that's what I did, and we got up with no problems. But if it were summer, maybe 90 degrees with high humidity, I'd probably think a lot longer. And even then I'd probably want the owner's advice. I don't think a 172 flies well in trees. The flight back to Chesterfield was smooth and easy, and I knew where we were most of the time without Mister Geeps' help. That 10902 wasn't much warmer, though. Chris took the photos on the way home, but I put thm in where they seemed to fit.